Cod Liver Oil from Agrapharm is an animal food supplement for horses. Cod Liver Oil is rich in Vitamins A and D3. It supports horses during the growth phase and in the winter months. When a horse only eats hay or grains, a Vitamin A deficiency may occur. This vitamin supports the resistance and can have a positive effect on the eyes, teeth, bones, skin and horn tissue. Sunlight results in the production of Vitamin D. When the days get shorter or during less sunny spells, horses produce less Vitamin D. D-Vitamins are important for the body's calcium intake. 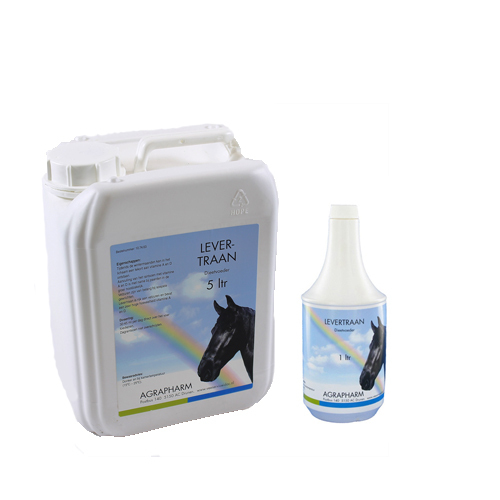 With Cod Liver Oil from Agrapharm, you can supplement any Vitamin A and D deficiencies in your horse. This is important for growing horses, among others. Agrapharm Cod Liver Oil is available in a 1 or 5 litre pack. Have you used Agrapharm Cod Liver Oil before? Let us know what you think about this product.